The bicycle lawyer, Steve Vaccaro and his firm Vaccaro & White are one of the sponsors of this year’s Bicycle Film Festival, June 25th-29th. Each day this week, they are offering a chance to win tickets to the festival by answering a trivia question posted on twitter. 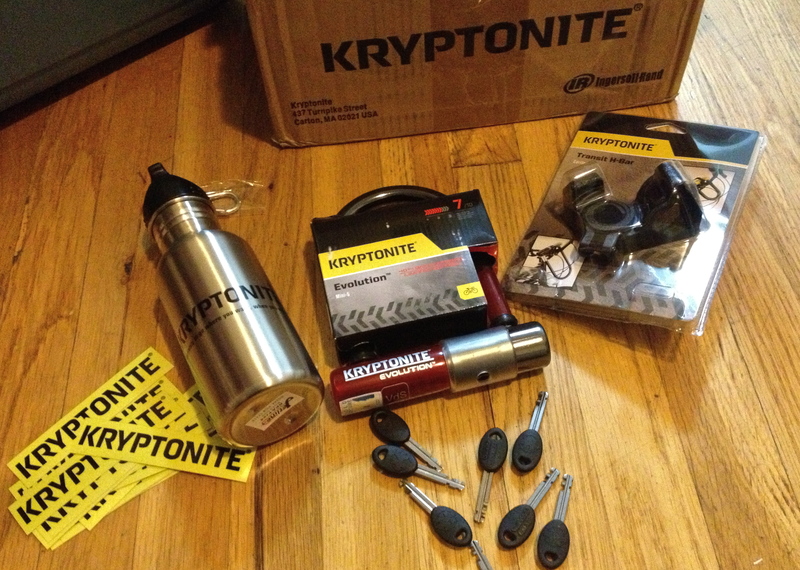 Instagram contest to win Kryptonite lock. 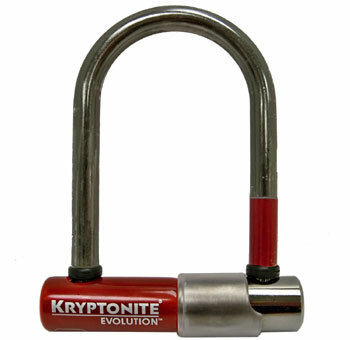 Kryptonite’s classic mini u-lock in a 40th anniversary limited edition ruby red. About the title of this post==I mean who doesn’t miss the Spin Doctors? I’ve only had two bikes stolen (that were locked to a structure or object) within the 21 years I’ve been riding in NYC. 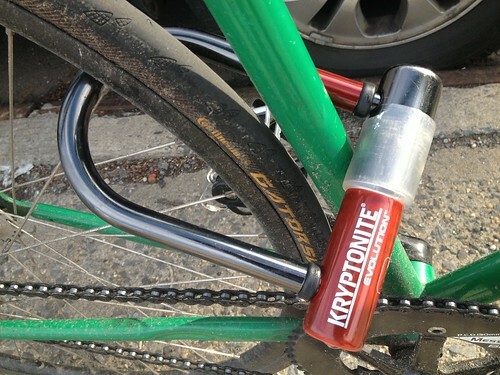 Neither of which have been with a Kryptonite lock, which has been a leader in bike security for decades. This is not to say there aren’t other reliable manufactures out there or that not having this particular brand was the only reason my bikes were stolen. Rather it’s been the name brand I’ve always gravitated towards and been the most readily available in NYC. When I was a messenger in the early 90’s the insider street knowledge was you either had the big Kyrptonite chain & lock or your bike got stolen. They’ve also been super active on the bike culture front and provided lots of free prizes for alleycat races and other events. Kryptonite’s generosity trickled down to little ol me and they recently sent me two care packages. The first came when I inquired about getting spare keys for the five chains and u-locks I have owned for years. I’ve lost one to many key sets in the past and didn’t want to be caught unable to get my locks open. The care package included a ton of stickers, a water bottle, their new transit H-Bar handlebar mount and a limited edition 40th anniversary U-lock. I was really excited about their evolution series 4 Mini-5 U-Lock, which has come out in limited supply to celebrate 40 years of bike security perfection. This is the same trusted lock as the as part of their evolution series (the signature orange color) with 13mm hardened steel shackle that slides into one end of the crossbar. The lock has a small key hole which is strategically placed in a reinforced cuff so as not to be easily pried upon by thieves. Weighing 770g or 2.1 pounds, this is the smallest lock in the series. It’s perfect for slipping in a back pocket or in a u-lock holder on the belt of a hip pouch (Fabrichorse.com) I use this lock to secure my back wheel to the frame. Its not long enough to fit around a standard NYC street sign and go through the frame and front wheel so it’s definitely used as a secondary lock. They do however make longer models to accommodate frame and wheel, as well as bigger locking options. Many urban riders only want to carry u-locks to avoid more bulky chains. The lock riding hipside or sticking out of a back pocket has become an icon of urban bike fashion and is such a classic design that Kryptonite’s K-4 lock is on permanent display in the Museum of Modern Art (MOMA) design collection. I felt rather nostalgic (or maybe old) that this was an anniversary edition with a flashy ruby red color on the crossbar. Check out contest details on the next page. Tour de France swag giveaway. 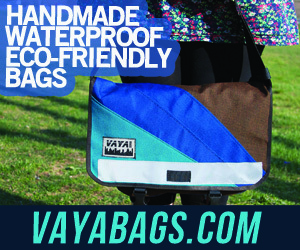 Now that the worlds greatest bike race is over, here is a little giveaway in conjunction with tourdefrancecycles.com. Bobotix x Instagram, take pictures, win prizes. Tod Seelie is a photographer who takes unbelievable photos of the cutting edge music scene: and… He also covers the artworld bringing us stunning images like this: His work can be viewed daily at Suckapants.com and at the arts magazine site FECALFACE DOT COM. ridebikesdrinkbeergetawesome.com (@RBDBGA) twitter T-Shirt giveaway. David S. will be rockin this in his hometown of Cleveland, getting awesome. Be on the lookout for more twitter giveaways…coming soon. wanna win all this from San Francisco messenger bag pioneers Timbuk2? Must have a facebook account to enter.